I have been a fan of the Swedish pop group ABBA ever since I can remember, yet I never saw them perform live in concert. Montrealers will be treated to the next best thing on Saturday, November 30 (8 p.m) at the Place des Arts when Sheldon Kagan Productions presents Abba Memories. "I brought them to the Place des Arts for two nights in 2011 and the audience response was great," Kagan told me. "ABBA is one of the groups that brings back fond memories. Everyone remembers Dancing Queen and Mama Mia. "Since the broadway and motion picture versions of Mama Mia came out a new younger generation relates to ABBA. At this concert many members of the audience sing and dance. It is a feel good show! Montrealers love ABBA!" ABBA Memories comes across as the "true" thing. The two and a half hour concert will feature an exceptional sound and lights as well as outstanding vocal and musical performances featuring legendary songs such as Dancing Queen, Chiquitita, Waterloo, SOS, Fernando, Money Money Money, Voulez-Vous, Super Trouper, I Have a Dream, Mamma Mia and many more. The eight performing artist, from a group now called One, are all Québecois: François Rochefort, Jacynthe Pépin Nancy McIntyre, Sylvain Haché, Claude Jaume, Gabriel Laberge Montpetitm Bruno Dubé, Cynthia Tremblay and Alexandra Chayer. Below is a clip of what to expect. There has recently been talk that the real ABBA might reunite next year to mark the 40th anniversary since they won the Eurovision Song Contest and were catapulted to global stardom, singer Agnetha Faltskog has revealed. ABBA formed in 1972 when Faltskog met guitarist and songwriter Bjorn Ulvaeus -- whom she later married -- and Benny Andersson and Anni-Frid Lyngstad. Andersson and Lyngstad were also married for a while. Both couples divorced. The group's self-penned hit "Waterloo" won the Eurovision Song Contest in Brighton, England, in April 1974, and immediately became a global phenomenon. They became Sweden's biggest-ever pop act and one of the most successful pop groups in history, selling more than 380 million records worldwide.The band never formally broke up, but their last album "The Visitors" appeared in 1982. In July 2008, all four ABBA members were reunited at the Swedish premiere of the film Mamma Mia, only the second time all of them had appeared together in public since 1986. For tickets to the Montreal show go to www.laplacedesarts.com or call 514-842-2112. A few weeks ago Patricia Kearns picked up the phone at Breast Cancer Action Montreal, where she serves as director of Campaigns and Outreach. A young woman introduced herself as Elizabeth Laushway, a member of the Hart House Chorus, a choir from Toronto. "How would you like it if we performed a concert in Montreal and all proceeds would go to you? This is something we do. We perform benefit shows in cities across the country. Michelle Landsberg suggested I call Breast Cancer Action Montreal to see if you would be interested." "Interested" Kearns blurted, "Did you say all proceeds would come to us?" It turns out Breast Cancer Action Montreal was in the process of organizing a fundraising event at Avis Antel's, a member of the board of directors. "We struggle to keep up with all the demands that come our way," she said. "We need to hire more people but we don't have the means. 'Yes, we are definitely interested.' I answered sincerely." Added Kearns: "We really want to get the word out so to show this group of musicians from Toronto how appreciative a Montreal audience can be. And to add to BCAM's coffers as much as we can." With that in mind Montrealers are invited to an afternoon of sublime music from 19th and 20th century French composers Maurice Duruflé, Gabriel Fauré, Charles Gounod, and Francis Poulenc on Saturday, November 30 (2 p.m. to 3 p.m.) at St. James United Church, (463 Ste-Catherine Street West). Performed works will include Gloria, Cantique de Jean Racine, and more. The concert will be directed by David Bowser and features pianist Jacqueline Mokrzewski and soprano Melanie Conly. Tickets can be purchased online at http://harthousechorus-montreal.eventbrite.ca/, or at the door. Proceeds from ticket sales will be donated to Breast Cancer Action Montreal. The cost is $10 for adults and $5 for students and seniors. Also check out this Facebook page. Here is a look at the choir. The Hart House Chorus is a 50-member SATB choir composed of students, faculty, alumni and members of the community at the University of Toronto. 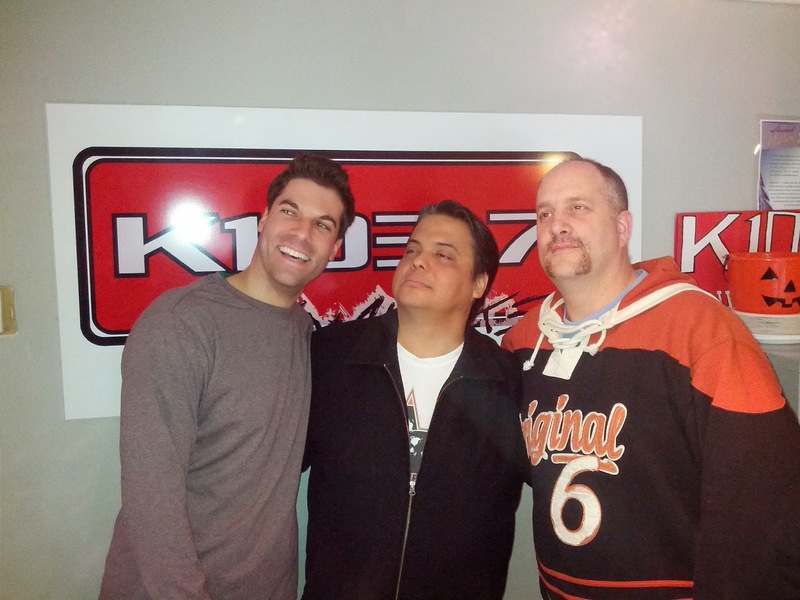 Program Director Al Gravelle has unveiled a new look to the K103 FM morning show, with Lance Delisle stepping in as the new partner to news and sportscaster Paul Graif and traffic and weather specialist Zack Rath. The crew are on weekdays from 6 a.m. to 9 a.m., playing today's hits and yesterday's favorites. I am one of those people who tunes in to every single English radio station in the morning for a bit. K103 FM broadcasts live from the Kahnawake Indian reserve. It first got my full attention when Ted Bird joined the morning team. He ended up leaving to join TSN 690 and was subsequently let go when Bell Media acquired CJAD, Virgin Radio and CHOM. Delisle steps into the role formerly occupied by Java Jacobs. He began his broadcast career in 1988 and has co-hosted and hosted almost every show at K103 over the years. For the past two years, he was working at CKON in Akwesasne. "This is my 25th year as a 'broadcaster,' however I have always felt I'm a communicator and a voice for the community I serve!" Delisle says. "I am very lucky and humbled by my place at K103 Kahnawake."